The central scene is a mandala inviting us to go on an “inward journey” as we meditate on the growing of the Kingdom of God. 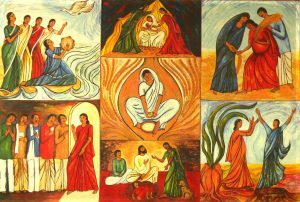 The biblical figures presented in the other six scenes can be our guides and companions on our “outward journey” to the poor, the oppressed and forgotten. At the Kairos Centre we have both male and female Spiritual Directors. You might come on retreat and meet with a Spiritual Director daily or for example at the beginning and end of your retreat. You might wish to see a Spiritual Director regularly and this would usually be every four to six weeks. Spiritual Direction is open to anyone wishing to explore their faith journey. There are no expectations or special requirements, just an interest in sharing your story with another person. We suggest a contribution of £25 for each session of spiritual direction. However, we would not wish anyone to miss the opportunity for spiritual direction and would encourage you to give what you can afford. Our Spiritual Directors are guided by the Retreat Association Spiritual Direction Guidelines. I am the Director of the Kairos Spirituality Centre in Roehampton, southwest London. I manage the centre which is owned by an English Congregation of Sisters, the Poor Servants of the Mother of God. Before arriving at the Kairos Centre in 2014 I worked for 20 years with older people living with Dementia in its many forms. I found that work immensely rewarding and continue to have an interest in the spiritual nourishment of people who are living with dementia. I am a tutor on the first year of the Ignatian Spirituality Course at the London Centre which aims to form participants in the Art of Spiritual Direction and in giving the Spiritual Exercises of Ignatius of Loyola in their various forms. I am available to offer the Spiritual Exercises at the Kairos centre either in daily life or a 30-day retreat. I am happy to meet with people from any Christian denomination, any religion or any anyone who does not identify with an established religion. I have an interest in the spirituality of 12 step programmes and for several years I have been assisting leading a weekly group and annual retreats that introduce Christian meditation as a way to practice the eleventh step 11 – ‘sought through prayer and meditation to improve our conscious contact with God, as we understand God’. I am currently a member of the team at the Kairos Centre. I have had training in Bereavement Counselling and Clinical Pastoral Education and worked for several years as a Hospital Chaplain. I enjoy the privilege of listening and sharing. I have many year’s experience of living and praying in community. My first years working were spent as a primary school teacher. When I retired from teaching, I became a key worker working with homeless people. My present ministry is on the team at the Kairos Spirituality Centre. I completed the Encounter Spiritual Direction Course, at the London Centre for Spiritual Direction in 2018. I completed the Encounter Spiritual Direction Course at the London Centre for Spiritual Direction in 2018. I am especially interested in journeying with young professionals and those who have come to find that a faith tradition no longer makes sense and yet still have faith in God. I am trained as an Ignatian Spiritual Director and can provide both the 19th Annotation and also a broader form of spiritual direction using visual arts, poetry and writings. I have provided several contemplative art workshops. I have also practiced as a qualified Art Psychotherapist for the last 20 years. In my work I have had an interest in spiritual abuse. I can work with trauma and attachment having also recently learned the practice of EMDR. I am interested in the interweaving of Spirituality with Psychology and Creativity. I welcome people from a variety of faith traditions and none.